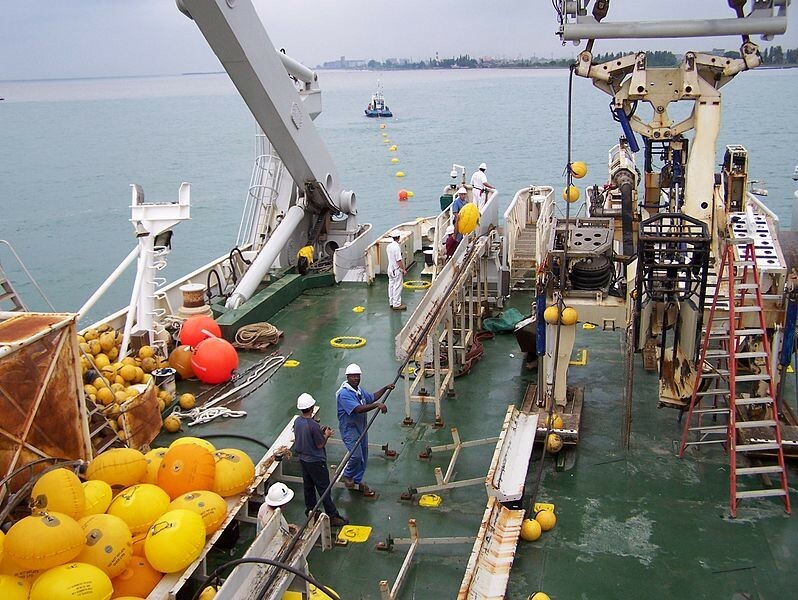 The more than 1000 million meters of submarine cable that several companies have been installing since 1866 are responsible for every day you have an Internet connection, even if it is wireless. That makes them extremely important cables, so it is essential that they can protect the optical fiber inside them. Once we show you the complete map in which to see all the cables that are installed and currently in the process of installation, and today we are going to stop to see a little more carefully what is inside these cables. They consist of up to eight layers, from the optical fiber of the interior to a whole series of coatings to treat that is not damaged. The bottom of the sea is not a safe place. Among landforms, anchors and bites of animals such as sharks, these cables are exposed to many dangers, and repairing them later is expensive. To give you an idea, you must first find where it is damaged, go there by boat, raise the cable to the surface with a kind of hook, join or solve the problem and re-immerse it. 2 – Polyethylene terephthalate tape. The first layer that we find, the outer one, is made of polyethylene, a very common plastic that covers the entire set. Below we have another small plastic layer of polyethylene terephthalate tape, which is a popular material for its high tensile strength or electrical insulation. And thirdly there is a series of braided steel cables, which are the main physical protection by giving the whole its hardness. Then we have two other protective layers, one made of polycarbonate and one tube of aluminum or copper, followed by another of petrolatum to protect against water. And then, just below those seven layers, we find up to 16 fiber optic wires. The number of wires depends on the cable, but each one is capable of transporting 3,840 gigabits per second, so that in total each submarine cable can transport 60 terabits per second. But one thing is to see everything in perfect graphics or schematic photos and another to see inside one of these cables live and direct. That’s why, on the YouTube channel of What’s Inside? 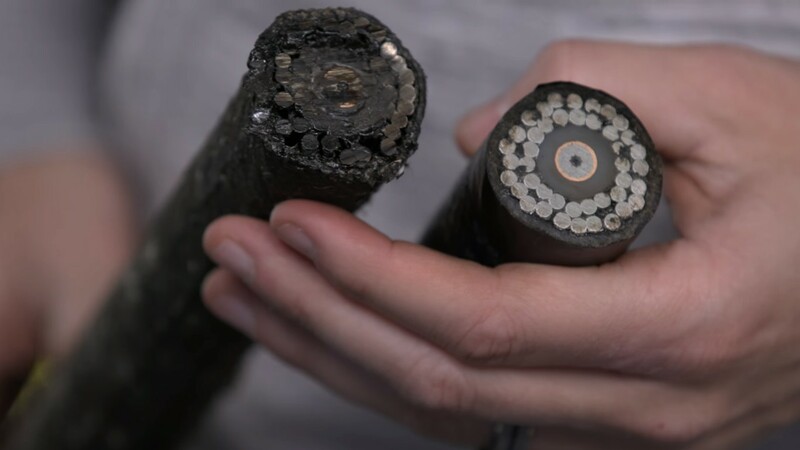 They took a radial and cut one of the submarine cables used by Google to see what is inside. The cable was provided directly by Google employees, and it is a small piece that they took on a boat to install it. The first sensation before cutting the piece given by Google is that it is heavier than it seems due to its density, and that it is completely rigid. Then comes the time of the chainsaw, which has a hard time cutting it because of all the protection it carries. And the final result is what you see in the video captures. In it we see that the two plastics around form a very thick layer, yes, but that most space is occupied by the steel cables with which the interior is protected from any blow or animal bite. Under the steel we see another thick protective layer, that of polycarbonate. Then we see that the copper layer is quite small, and that below we found a second layer of steel cables, this time smaller than the initial one. And then, right in the center and almost imperceptible, we have a small plastic tube coated with petrolatum with fiber optic cables. These are extremely thin, as much as you can have in your house. 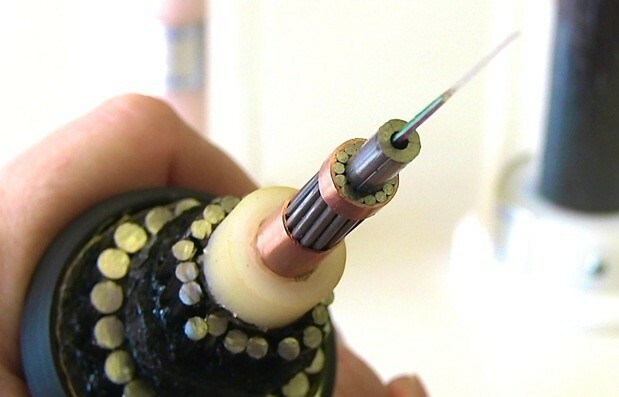 As we can see in this other image taken by Tim Hornyak for ComputerWorld, the design of the cable has very few variations depending on the company that manufactures it. In this photo of the cable manufactured by the company OCC we see that the design and composition is practically identical to that of Google. 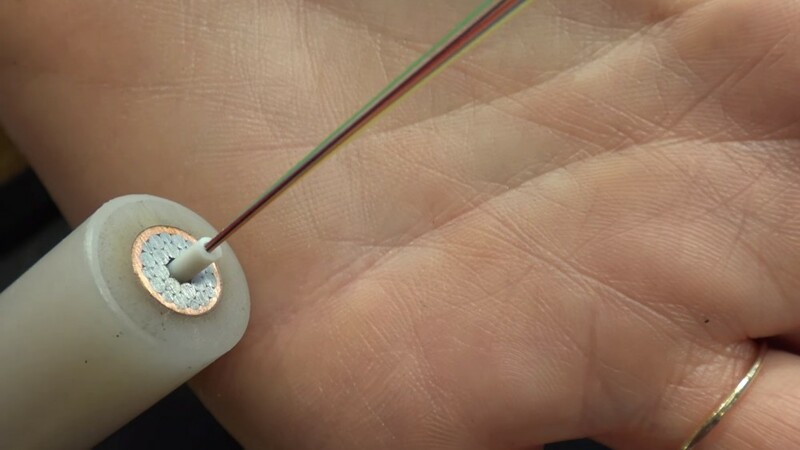 And if you think it’s a bit of an exaggeration to cover a cable in which there are only thin strands of fiber optic, remember that marine animals have been sighted as sharks hitting bites, and that all these layers sometimes are not even enough to protect them from these animals.